The Mom: Informed: How Much Proof Do You Need And How Much Press Does It Take? How Much Proof Do You Need And How Much Press Does It Take? If something is shown to be 500% safer than something else, and proven to save 92 out of 100 lives, why would you not do the safer thing? Doesn't it seem logical to do the safer thing? What if that thing is PROVEN to save your child? Does that change your mind? Would you do it if you were shown that this thing is a very simple and easy thing to do? It takes no more effort than most other things and yet millions of kids don't get the benefit of this thing. Would you like to know what it is? That's right. That's ALL you have to do in order to increase your child's chance of surviving a car accident by 500%. EVERYONE would be safer rear-facing, but, it's impractical for us adults whereas it is NOT impractical for kids. Your child needs to rear-face to the MAX of their convertible carseat. Be sure to READ THE SEAT MANUAL AND THE CAR MANUAL so that you will know the specifications of your carseat and the recommendations for carseats in your car. Even the cheapest carseat will safely rear-face a child up to 35lbs. The Cosco Scenera is around $40 at Wal-Mart. I personally like the Britax which will rear-face up to 40lbs. or the Radian XTLS which is now the Diono RXT which rear-faces up to 45lbs. Well, at 2, if your child was in the 95% for height and weight, they would have to be 37in and 33lbs. Hmmm...even the cheap Cosco will still hold your child until age 2, not 1, 2. The Cosco Scenera maxes out rear-facing at 36in and 35lbs. So, even with the cheapest, lowest limit seat and the biggest kid in the neighborhood, you can still safely rear-face your child until at least age 2. If you went for the DionoRXT, your child can safely ride rear-facing even longer. Hopefully to age 4 or 5 like the kids in Sweden where they rear-face until around age 5. They also lowered their child fatalities to almost 0. That's right, their parents can't say they are "TOO big to rear-face". As a rather short adult with even shorter relatives, I can assure you, we as adults would rather have our legs folded up in the seat with us instead of dangling in the air. Kids want it even more so. Not only that, there haven't been ANY reports of broken legs due to rear-facing. However, the NUMBER ONE injury reported in crashes involving forward facing kids? Broken legs and pelvises. Kids are more flexible than adults and I assure you, they won't mind their legs being where they are when rear-facing. If your child ONLY knows rear-facing, they can't "miss" forward facing enough to "want" to do it. If your child threw a fit wanting to touch a hot stove, would you allow them just so they won't scream anymore? Would you allow them to get their way no mater what it was just because they screamed? So why would you allow them to throw a fit and get something from it here? Not to mention, your kid is hating to be strapped down in a seat, they don't care that it is not facing the front. Please Rear-face PAST One Year! I just wish you had mentioned the Sunshine Kids Radian XT, which has the heighest RF limits on the US market. It RF to 45lbs and has the heights shell height. I've seen 5 and 6 yr olds RF in this seat. Yes, it has a higher limit, but, the examples I shared are 1) the cheapest so no one can use that as an excuse and 2) the highest rated, safest seat. I should probably do another post next about the different seats. Thanks for the inspiration. As a car seat technician, I appreciate you getting the word out there about the benefits of extended rear-facing. I cringe when I see little 20 pound one year old forward facing. However, I would like to point out that the Britax seats are NOT the "highest rated, safest seats." Britax has a great marketing department that has convinced consumers that this is true, but it's simply not the case. In fact, test results released by Transportation Canada and NHTSA indicate that Britax seats perform no better than most other seats (and in some regards, perform worse). Don't get me wrong, I love Britax seats. There is not an easier-to-install seat out there, and a proper installation is SO important. But there are many other very good, easy to use seats available, and I hope that in your other post, you will review them fairly. This is the first time I've heard of this. Personally, my little one cried unconsolably in her rear facing carseat, for every single journey(it took 15 minutes to console her after each trip) until I put her in a forward facing seat at 9 months. I now drive MUCH more safely than I did when she was crying...so perhaps each situation is slightly different? This has nothing to do with your driving. If you do any research on babies spine and calcification of bones and their joints, you would find out that babies can be easily internally decapitated in a minor traffic accident and they have a greater chance of leg and pelvis fractures. You can only drive so safe, you cannot control everything and everyone around you. The LAW here is 12months and 20lbs for a reason and they are looking into making it 2years and 30lbs. IMO, 9 months is WAY TOO soon, regardless of crying. I would fairly rate all carseats, I was under the impression based on the carseat safety commissions that they were the top rated. thanks for the heads up, I will look further into that. Naturesmother: 9 months?! WAY too early, not to mention ILLEGAL. I hope for your child's sake that you do not get in an accident. Mom Informed: great post! I am passionate about this too! Rear facing to me in a non negotiable safety fact that my kids don't get to debate on. My DD is 28 mos and RF in a Britax Marathon 70, she is little, so will make it to at least 3, hopefully 4 years. If she pitched a fit at any age, I would override her opinion and RF her anyway, it's for her life and her life is more important to me than her opinion. 9 mos is just insane, that is neglect in my opinion, there is not one state of all 50 that allows that by law. Turn your back to RF, they will thank you with their life if you crash. She's now 15 months. Her current forward facing carseat is from 9 months ..or so the packaging said - surely they wouldn't advertise that if it was illegal?...I honestly had NO idea it was illegal??? I was not knocking your post, I think it is great. The point I am trying to make is that if you have a baby crying all the time, you cannot concentrate very well on what you're doing...hence, chances of me crashing were increased by crying...I almost did on a few occasions. Of course you can't control what happens around you, but if YOUR chances of CAUSING an accidents are increased, surely you have to weigh up your options??? I'm not exaggerating when I say she cried inconsolably the entire time, it was a complete nightmare. I felt so guilty and hardly went out at all(we live rurally where public transport is not at all dependable). Just interested, how is it legal to hold your baby on a bus? Ok, hold on, I'm in the UK...I'm pretty sure it's not illegal here. By the way, a newborn does not 'pitch a fit'. I am a (more or less) attachment parent, and all I can think is that either she was carsick from rear facing or she didn't like that she couldn't see me. I did feel from her. Give birth to these wonderful little things and then stick them in big chunks of metal strapped into little plastic cages, out of site of their loved ones. Yes, it keeps them safe, but you've got to ask yourself...will we be strapping helmets onto them next? Naturesmother-I would take a pissed off screaming child over a dead one, any day of the week. naturesmother: I too would take the screaming over a child with a broken neck from a forward facing during an accident. My babies did not like riding in carseats either. They preferred to be in my arms. I understand the stress a crying baby causes while you are trying to drive. I also live far away from public transit. When my kids are little, I kept our car trips as short as possible and limited going out to avoid the crying. Whenever I could, I had my husband drive so I could sit next to the baby and entertain him/her. Eventually the babies outgrew it. My middle child is the most difficult and took the longest, but eventually it happened for her too. FWIW, we love the Sunshine Radian seats because they fit kids for a LONG time. My boys have long torsoes and are 90-95% for height. My oldest son outgrew the Britax seats around 3.5 years old. Yet he was able to ride in the Radian until age 6! I just wanted to point out that the Cosco Scenera RF to 40 pounds and 43 inches if you buy it from Target for $50. Only 35 pounds from the Walmart version though. For the $10 difference, you are better off going to Target if you are in the market for a cheap seat. Thanks for the info. I didn't really know which seat were where and what. I mainly just wanted two examples. I need to make a note of this to add to the growing list. naturesmother- I was in your exact situation! My son HATED his car seat from the time he was born! We would have to strategically plan trips, stop frequently, and many times not go anywhere altogether because we were afraid we would get stuck somewhere trying to console him 9as we did more than a few times). He would cry so hard he could barely breathe. Around 9 months old however, he was suddenly no longer inconsolable in his rear-facing car seat. We could go further and even drive while he was awake! He must have gotten used to it and is still rear-facing at 10 months currently and will until he no longer fits in his convertible car seat. I hope, if your little one is still under your car seat recommendations, you will rear face him/her NOW. Or if you have more, you will not forward face until they are grown past the manufacturer limitations. There is no good excuse why you shouldn't because it is a matter of LIFE and DEATH. I rear face and will until my son outgrows the specs. I do the research and regardless of if you are distracted with a crying child or not. It is not a question of if but WHEN you will be in a accident and rear facing has been proven many times over regardless of the law to be safer. Babies cry, they get over it they wont even remember being rear facing when they are older but you will remember if you put their life at risk by FF them too soon. I turned my son at a year (with his ped's approval). I turned mt oldest daughter at 18 months after driving over 700 miles with het screaming (the ped had also ok'd her turning around once she hit 20 lbs - just took her a little longer to get there). The are both happy, healthy 7 and 4 year olds respectively. My youngest is 20 months old and still RF due in part to the fact that she is not even 18 lbs yet. I also won't turn her until her geneticist gives her approval due to the fact that she had down syndrome. She does have a friend who is 3 days younger than her who also had down syndrome who weighs 35 lbs and he faces forward. Well it's all about statistics and odds, yes 500% safer, 92% lives Saved.. But those are in accidents.. USDOT says there was 6.13 million car accidents in 2002, the us census in 2000 put the population at 281.4 million people, that's 2% of the population involved in an accident.. Accidents are caused, now I know natures mom isn't in the US but In 2009 distracted driving was cause of 20% injury accidents. If you need to weigh one risk for another I don't think we should jump all over her. You would be completely safe if you didn't take your child in a car at all, but because you do no one would say you "don't care" about your child at all.. All this fear mongering, just follow the law, do what's best for your child, that's all every parent tries to do. naturesmother - wow, feel attacked much? I know where you are coming from. But unlike prior posters would NEVER throw out the dead baby card at you. Being able to travel in an environment free from the kind of screaming that limits your driving capability (to the point that you are a danger to yourself and the public by being on the road), is more conducive to the entire family getting home safe and sound. We all make decisions for our families, for the BEST of families - whether it be regarding pregnancy, birth, discipline, religion, education, diet, socialising - the list goes on and on. Lets not attack each other and show some respect. We all do what we feel is right in our own specific situation. Just a nit-picky point, correct me if I'm wrong but in the US you can't actually know which seat is "safest." 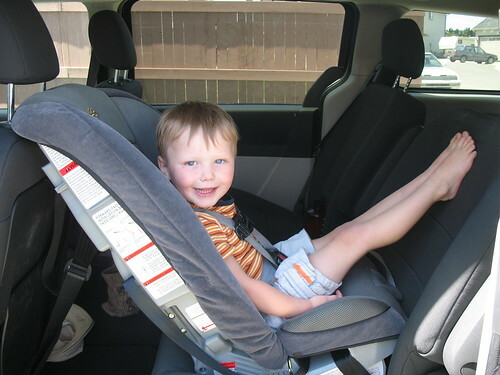 Car seats are ranked according to other factors, like ease of use, etc. But as far as SAFETY goes, all car seats on the market pass some standard set of tests, and (at least when I was researching convertible seats a couple years ago) there was NO way to tell how seats actually fared against each other safety-wise, other than passing the minimum. I even called Britax to ask them about the additional testing they say they do, and was told that no one other than the staff who perform the actual tests knows what the results are, it's not public information. So when we talk about the "safest" seats, we don't know actually know which seats are objectively "safer" than others, other than knowing which are installed and used correctly. I got the mirror that attaches to the seat so my ds can see just as he could ff. He is the last of his friends to be rear facing at 13 months. He has always had s tough time in the car so we do everything we can to limit car trips but if we have to go somewhere we make sure we are not in a hurry and pull over to give him a break/ bm/ cuddles if needed. I also ride in the back whenever my Hubby is with us. Singing, a variety of toys, water bottles, or milk bottles, a favorite treat, or getting the baby to sleep before you leave can all help limit crying. Also like I said already, the mirror made a big difference. weighing less than 20 lbs (9.1 kg) OR is less than 1 year of age. According to their site, it should rearface to 40lbs. I think it's worth stating that if your child hates rear facing...try a different seat! My first daughter HATED the car and riding in the back alone. When we moved her from her Graco Seat Safe 1 Infant seat to her convertible Radian car trips became MUCH better! Check your stores return policy and try a new seat before you call it quits! Amber, I would wager the wording on that is just poor and it is meant as it if the child is under a year and less than 20lbs that rearfacing is the ONLY option for the seat. As far as I am aware 1 year AND 20 lbs is the law in every state. @Amber: I think the manual is saying you absolutely HAVE to rear face a child that young and small, but it's allowed (and encouraged) continue rear facing beyond that. @naturesmother: Just to the point of holding a baby on a bus, buses are built differently from cars and protect occupants primarily through compartmentalization. My daughter outgrew the cosco scenera's rear-facing limits at 21.5 months... she has a long torso and had less than an inch of shell above her head, so it does happen! If it weren't for that she would still be rear-facing for a few months at least, she is 5lbs away from the weight limit but tends to gain rather quickly. I share car seat safety info any chance I get. If it weren't for two friends of mine, I wouldn't have a clue about any of this. My son was a huge fit-thrower when he was still in his infant seat. We have a radian now and he's been happy as a clam - still rear facing. I really think that even the worst fit-throwers can be appeased - sometimes it may require taking your child to a store and putting them in every single seat until you find the one that makes them happy. But nothing my son can do will persuade me to turn him forward before I absolutely have to. Yes, crying children are stressful and that can affect your driving. But the bottom line is that I, personally, can quite easily put up with just about any level of tantrum or meltdown for the sake of my kiddo's safety. I would like to point out that most of the time when parents complain about kids throwing fits while rear facing, they are typically older babies still in rear facing only infant seats. My own child was like that and would throw a fit when we put him in his car seat. The reason was, it was too reclined and he wanted to sit more upright. So, getting a convertible car seat would fix that problem and the child could still rear face. I am a CPST as well and would not forward face before 3 years old at a minimum (unless I had a 45lb 2 year old or something and had no choice) and I would do everything I could to avoid it before putting my child at risk. I strongly encourage parents to rear face their children for as long as possible and am always dispelling the common myths of broken legs, uncomfortable children, and whatever else they can throw at me. Convenience should never come before safety.